Disclaimer: I received a free entry into the Urban Bourbon Half Marathon as part of being a BibRave Pro. Learn more about becoming a BibRave Pro (ambassador), and check out BibRave.com to review, find, and write race reviews! I've had my eye on this race for several months now. With the race being on a Saturday and me being schedule to work on Friday it seemed a little out of reach. Luckily with some master maneuvering of my work schedule I made it work. And I signed up immediately! If you aren't familiar with Kentucky it is considered the birthplace of bourbon making it the perfect setting for a bourbon-themed running event. But this race isn't all fun and games! It's hilly! (Depending on your point of reference… compared to central Ohio it is.) The course map and elevation profile can be seen below. If race morning isn't enough to satisify your bourbon needs no need to fear! The race has several options to fill your weekend plans. These are so cool! 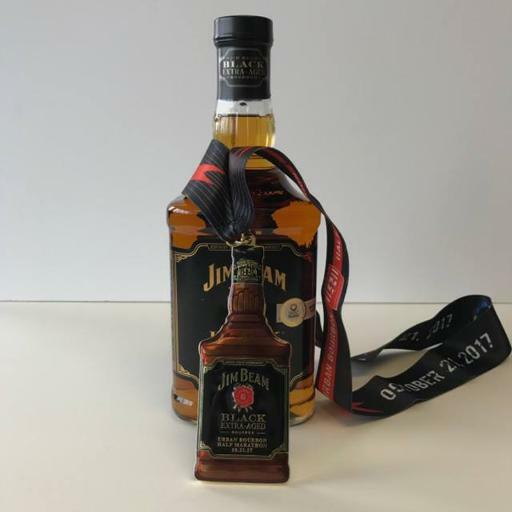 Last year's medals were dipped in wax replicating actual bourbon bottles. You can't go wrong with these themed medals. Bourbon related? No. But I have a sweet tooth like no other and I am counting down the days to get my hands on one. Try and resist these. Discount Code: Use code BourbonRave2017 for 10% off!